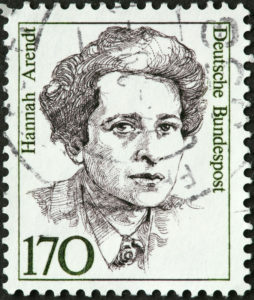 Hannah Arendt was a trailblazing female philosopher, a Holocaust survivor, and one of the most important thinkers of the twentieth century. Wildly controversial, Arendt taught the world to understand the connection between imperialism, the pernicious history of anti-Semitism, and the rise of Nazism, and shocked the Jewish establishment with her famous reporting on one of the most consequential trials of modern times in the book Eichmann in Jerusalem. In honor of Yom HaShoah (Holocaust Remembrance Day), Rabbi Shira and Sixth & I community member Chris Gray lead this text-based discussion of Arendt’s distinctly Jewish approach to resistance, radicalism, and activism in the face of evil. No one will be turned away from any of our classes due to lack of funds. For more information, please contact our Religious Programming Senior Associate, Annie.